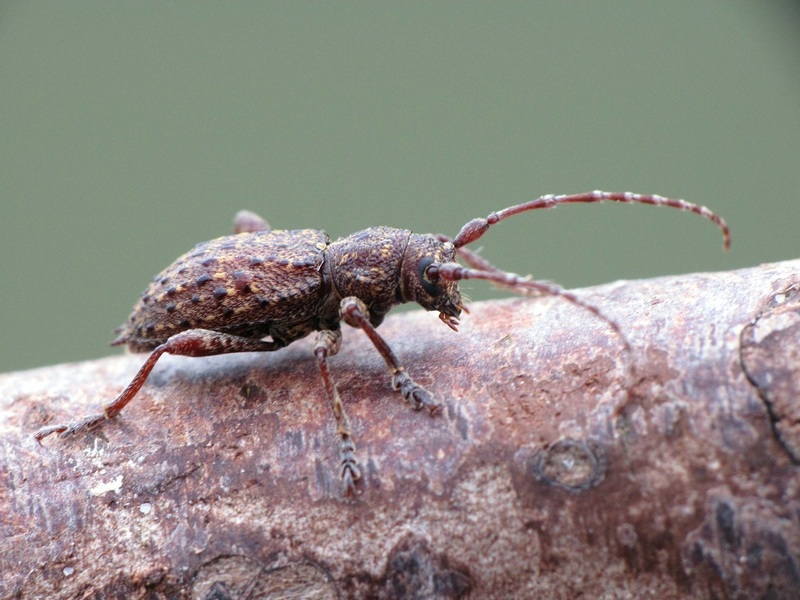 Plectrura spinicauda is one of about 1200 long-horned beetle species (Family Cerambycidae) found in North America. Most species in this family have elongated and cylindrical-shaped bodies, and antennae that measure at least half the length of the body. Species in the subfamily Lamiinae tend to have rather vertical faces, and thus are commonly called "flat-faced longhorns". P. spinicauda is found in Western North America from Alaska south to northern California. Click here for more information on the Cerambycidae. Borror, D.J. and White, R.E. (1970). A Field Guide to the Insects of America North of Mexico. Boston, MA: Houghton Mifflin. Species Plectrura spinicauda. BugGuide. Accessed 27/03/2018. Subfamily Lamiinae - Flat-Faced Longhorns. BugGuide. Accessed 27/03/2018.